travels and speaks at Universities an Colleges about "Ethnic Diversity" & its importance to the future of America. Nikki is an American poet, writer, commentator, activist, and educator. One of the world's most well-known African-American poets, her work includes poetry anthologies, poetry recordings, and nonfiction essays, and covers topics ranging from race and social issues to children's literature. She has won numerous awards, including the Langston Hughes Medal, the NAACP Image Award, and has been nominated for a Grammy Award, for her Nikki Giovanni Poetry Collection. Additionally, she has recently been named as one of Oprah Winfrey's twenty-five "Living Legends." MORRIS GEARRING's one-man show, "SOMETHING ABOUT OSCAR!" DESCRIPTION OF THE SHOW: Actor/Singer/Alvin Ailey dancer, MORRIS GEARRING, portrays the life of Chicago legend, OSCAR BROWN JR, through Dance and the music (Jazz & Soul) and Spoken Word of OSCAR BROWN JR. MORRIS has a Quartet on stage. Often he features Guest Singers such as MAGGIE BROWN, Oscar's daughter. NIKKI GIOVANNI, acclaimed poet, writer and educator, is often featured in "SOMETHING ABOUT OSCAR." 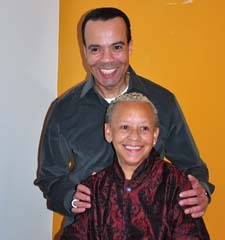 NIKKI GIOVANNI, acclaimed poet, says: "Wear your good shoes cause Morris will make your heart go dancing." NIKKI GIOVANNI speaks to "The Chicago Defender."